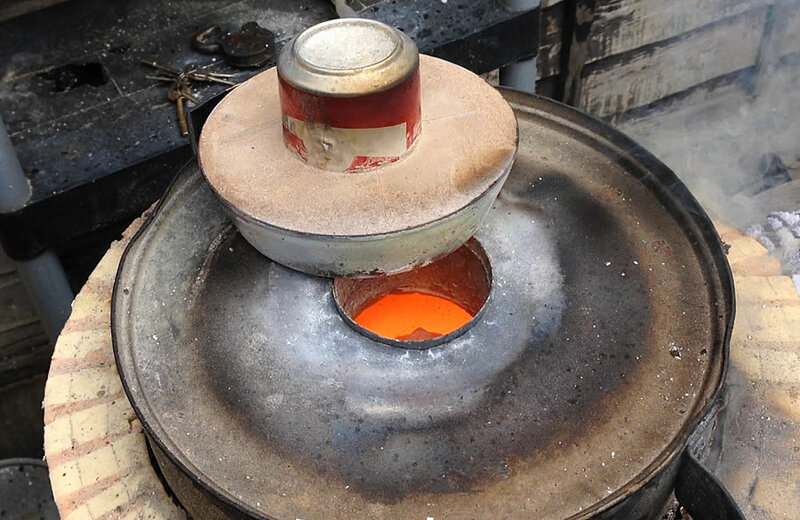 Having built an excellent home made metal foundry out of high temperature refractory, I was disappointed to realise that the refractory itself was not an effective insulator. Its job was to handle high temperatures and remain stable – not falling apart. In truth it does its job well, but that still left me looking for insulation. Foundry insulation is usually in the form of brick or blanket, both are expensive and I didn’t fancy covering my mobile foundry in a squishy white blanket. Cleaning out my shed I came across this… a leftover from another project. High Temp Insulation board - would it cope with a foundry? This is insulation board made up of a thick foil backing and expanded foam. It’s commonly used here in the UK as building insulation and I’d imagine there’s similar products throughout the world. The thing with this insulation is that it’s high temperature – it holds up well to fire. That got me thinking… if I could wrap it around my foundry... would it work…? So to persuade this flat, straight material to go around the curve of my foundry, I ran it across my table saw cutting dozens of slots roughly 20mm apart nearly the full depth of the material. Sure enough this made it nice and pliable. I sanded the outside of the foundry to give it a key and cleaned it thoroughly with white spirits. 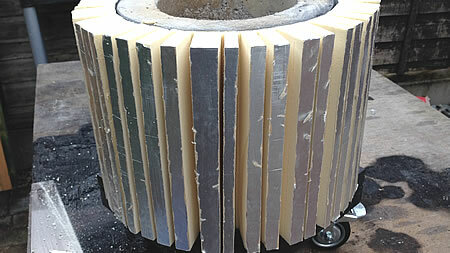 Then I coated the foil side of the insulation and the foundry with contact adhesive. It was a bit fiddly but the glue did its job. Now I had a lot of grooves to contend with. A trip to the hardware store later and I had a cheap can of expandable foam – but crucially this is HIGH TEMPERATURE foam, not the ordinary variety. I carefully squirted the foam in every groove and made a real mess – nothing new for me there. A few hours later and everything was dry and looking like a mad science experiment. A simple wood saw made really easy work of trimming back the mess to produce something that didn’t look too bad and had the advantage of not weighing the foundry down any further. Well yes, it did… initially at least. For perhaps around a dozen outings the insulation board really did seem to do a nice job. The insides of the foundry were visibly hotter, took less time to achieve that heat stayed hotter for longer. I never witnessed the foam burning (other than when I accidentally poured white spirit on it, and even then it merely blackened the foam - no real damamge). Whilst I never witnessed or smelt any gases or smoke coming from the foam whilst in use, that doesn't mean there weren't any... so I only worked outdoors just in case. I’m sorry to say I’ve fallen out with the foam insulation method. It was simple and cheap and it really did work, but it didn’t last long. After a dozen or so uses I felt the foundry just wasn’t getting as hot as it did and there did seem to be a black ring next to the foundry wall. Upon proper inspection it seems the foam was disintegrating over time and was no longer effective. However, it did cause me to think again and that time I came up with an even better idea – plaster insulation. 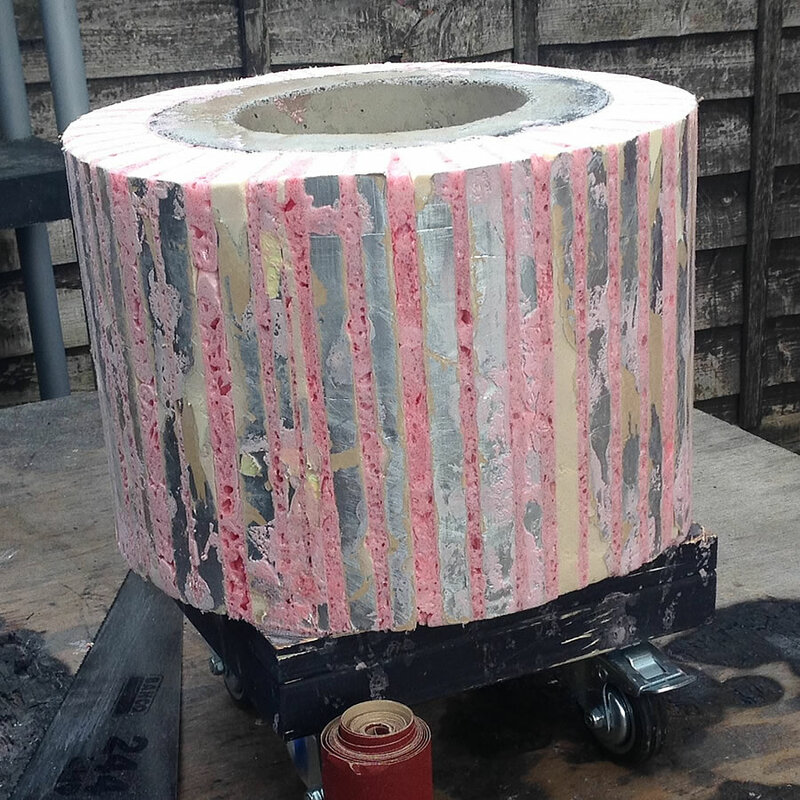 To see the discovery of the foam failure and to watch me remove and improve upon it, adding a very versatile plaster insulation layer (wonderfully cheap and easy to do – plus MUCH more effective – it’s great!) then watch my Get Plastered Video here or read about it here. 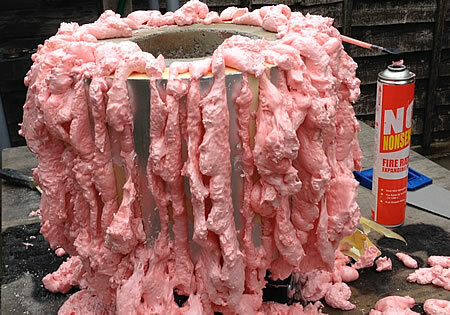 I still maintain the foam insulation is plausible… if you’ve got plenty of it and don’t mind re-doing everything every dozen or so burns, great. Personally I like an easy life and the plaster insulation seems to be giving me that. Its simply awesome. Excellent planning and execution. I love the reasoning given for every design element.